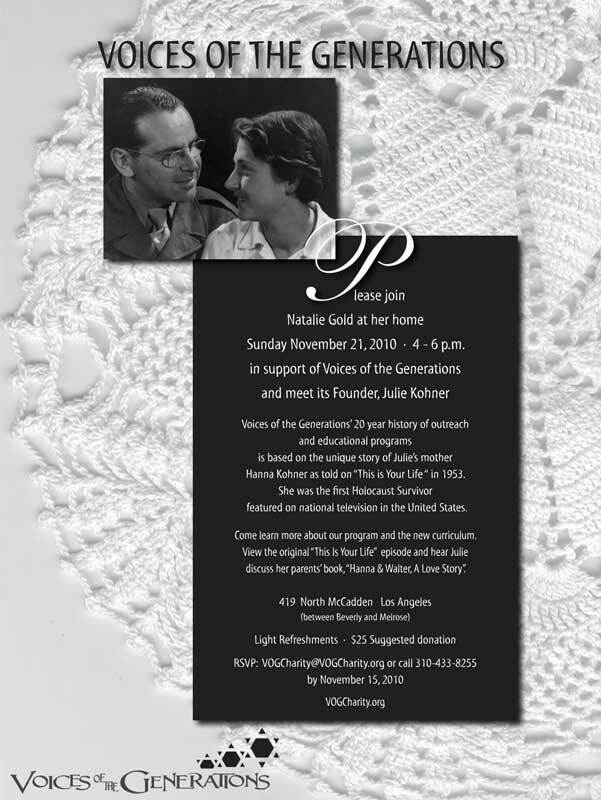 Please join Natalie Gold at her home Sunday November 21, 2010 from 4 – 6 p.m. in support of Voices of the Generations and meet its founder, Julie Kohner. Voices of the Generations’ 20 year history of outreach and educational programs is based on the unique story of Julie’s mother Hanna Kohner as told on “This is Your Life” in 1953. She was the first Holocaust Survivor featured on national television in the United States. Space is limited. Please RSVP by November 15, 2010 to VOGCharity@VOGCharity.org for directions. What an awesome way to celebrate life, survival and the power of faith. I can think of few non-profit organizations that have a greater potential to influence tolerance in the world. Best of luck!